In truth, I haven’t had the best run with baby carrying. First time around I was a bit stressed out and second time around I had a massive baby; both times I had the wrong style of carrier to tote them without pain so I just gave up. Having just had my third baby and third c-section, and after nearly six years with Babyology, I like to think I now know my stuff. Sure, there’s lots to re-learn but I have a bit more confidence to try things I may have failed at the first two times. 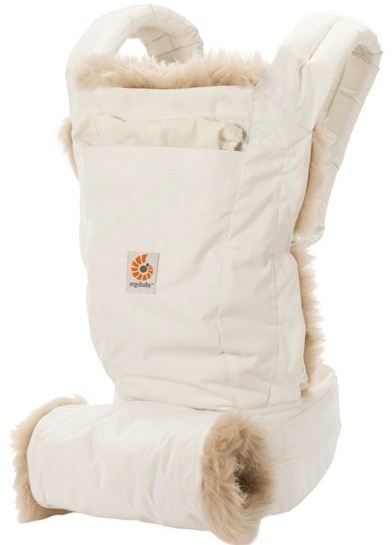 Enter the very glamorous Ergobaby Winter Edition Carrier with hand muff. All practicality aside, this baby carrier makes me feel like a Hollywood star, perfectly complimenting my mostly black attire and perking up a tired new mummy face with its flattering white glow. And just look at that faux fur trim people – so glam, it’s white hot! Whether it’s a good thing or not, I’m a sucker for great aesthetics – why else would I be on the Babyology team? We’re all about impeccable design and it just has to look good as well as function. My walks with baby Jarvis all snug in his Ergobaby Winter Edition carrier are blissful. Put quite simply, he jots off to sleep and I get to kiss his sweet-smelling newborn head while getting myself out of the house. It’s win win. While it isn’t yet cold enough for me to attach the hand muff, my baby will still be little right through winter and I have bad circulation to my extremities, so I can see the hand muff in full use during the school runs for my older boys during winter. The other remarkable feature of the Ergobaby Winter Edition is its removable quilted lining, so it transforms into a lightweight carrier in warmer weather. Because the Ergobaby is the only carrier you’ll ever need (carry babies and children from 3.2kg to 20kg), this is an essential feature! Read up here on its other features, such as full adjustability and carrying positions. The photo at top and above, shows an older baby in the carrier. The photo below shows baby Jarvis in it at four weeks old, using the Infant Insert which must be used from birth until baby has some head control. He and I sure had a lovely walk that day with zero back pain for me and a perfect ergonomic sitting position for baby. So it appears I’m a baby wearing convert, and with two older boys to run around after, it’s a good thing. Baby is safe and happy, close to his mama, and my older boys get more attention from me with my hands free. 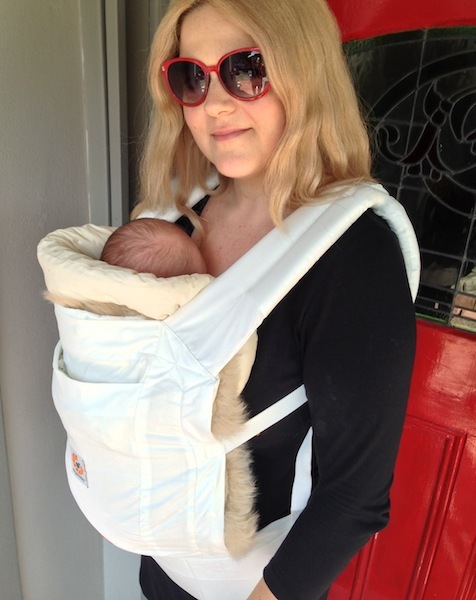 Many thanks to Babes In Arms for supplying the Ergobaby Winter Edition Carrier with hand muff for road testing. We’re having a blast and that’s no easy feat with three kids! Buy from Babes In Arms for $269 – the Infant Insert is an optional extra.